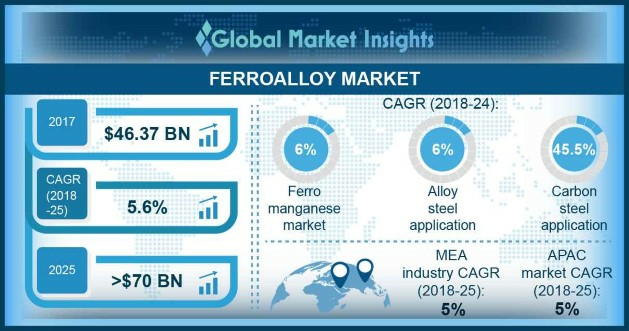 Ferroalloys Market size will surpass USD 70 billion by 2025; according to a new research report by Global Market Insights, Inc. Growing construction industry in emerging economies of Asia Pacific region is one of the prominent factors influencing the growth of ferroalloy market in a positive manner. Rising population levels along with growth in per capita income in the region due to legislative decisions taken by governments have propelled overall construction sector in recent years. Ease of doing business index of many countries has improved in the region and this will boost the morale of private sector companies to invest extensively in order to reap greater profits from this resourceful market. High operational costs incurred in production, coupled with stringent industry standards and environmental regulations may hamper the product market growth in near future. Amount of energy consumed in manufacturing some alloys is high and volatility in fuel prices will fluctuate the production cost. This will have a negative effect on the market growth. On the basis of product, ferroalloys market is segmented into ferromanganese, ferrochrome, ferro silicon, ferro silicon manganese and others. The others segment includes noble alloys such as ferronickel, ferro titanium, etc. Among these ferro silicon segment will cross USD 10 billion, showing a moderate growth rate over the forecast timespan. This is due to its ability to prevent carbon loss during steel production. It is widely used as a deoxidizer as well. Ferrosilicon has end-use in various industries such as metallurgical, chemical, electrical and electronics.